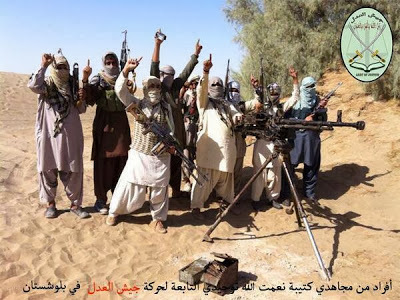 The Sunni insurgent group Jaish ul-Adl, which has carried out a series of attacks in southeastern Iran in the last year, killed at least one soldier and wounded six on Monday. The Deputy Governor-General of Sistan and Baluchestan Province said, “One border guard soldier was killed and 6 others were wounded in the Monday night clashes between the Iranian military troops and the armed outlaws at Saravan border (with Pakistan). In October, Jaish ul-Adl killed 14 Iranian borders in an attack in Saravan. Iranian authorities, including the Revolutionary Guards and the Border Guards, claimed they foiled subsequent attacks, while 16 insurgents already in prison were executed. Iranian officials also denied that Jaish ul-Adl had retaliated by assassinating the prosecutor of the city of Zabol in early November. Instead, a provincial official claimed on Tuesday that 10 people, unconnected with the insurgency, had been arrested over the killing. as named seven Western oil companies whom Iran wants to return to its oil and gas filed, following years of withdrawal of investment. Speaking to reporters on Wednesday, Zanganeh said Iran will offer contract terms in April 2014. The seven companies are Total of France, Royal Dutch Shell, Italy’s ENI, Norway’s Statoil, Britain’s BP, and US companies Exxon Mobil and ConocoPhillips . Zanganeh oversaw a surge in investment by Western companies during his previous period as Oil Minister from 1997-2005. Total returned to onshore fields in 1997 and Shell in 1999. Western companies withdrew from their stakes during the Ahmadinejad era, including their investment in the giant South Pars gas field. PreviousSyria Today, Dec 4: Insurgent Counter-Attack on Key City Near Aleppo? NextIsrael & Saudi Arabia Op-Ed: Will Iran Bring an Israeli-Saudi Alliance?